A large, complete copper alloy trade weight dating to the post-medieval period, to the reign of William and Mary (AD 1689-1694). The weight is circular in shape with a raised lip and concentric circles on the front face. Within are several control stamps; a crowned W over M at c. 11 o'clock, a sword for St Paul's (London) at 12 o'clock, a letter A for avoirdupois at 1 o'clock and an ewer for the London Founders' Company at 5 o'clock. The weight weighs 3.720 ounces (105.4 grams), just under a quarter of a pound. 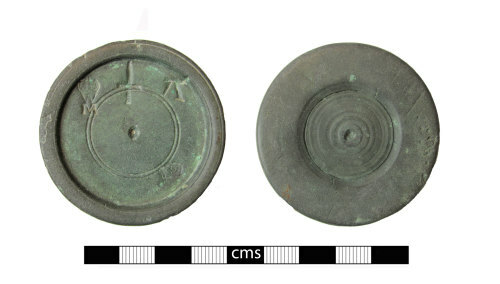 Unusually the reverse of this weight appears to have a separate plug in the centre as there is a gap around its circumference; this may be damage although this type of damage has not been seen on other examples.